Glasgow City Council unveiled the plans to combat a 'depressing image' of the city. 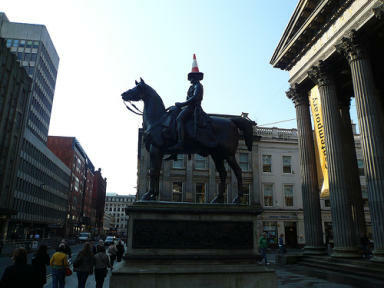 Plans have been unveiled to prevent revellers completing a Glasgow tradition of placing a cone on the head of the iconic Duke of Wellington statue. The proposals by Glasgow City Council to revamp the monument and raise the size of the plinth it sits on have been tabled in an attempt to “prevent/reduce vandalism”. For years, the A-listed statue has been the target of students and revellers who climb the plinth to place a traffic cone on the monument, which is situated outside the city’s Gallery of Modern Art in Royal Exchange Square. The council is seeking to stamp out this "depressing image" of the city, by doubling the size of the plinth it sits on so that only the "most determined of vandals" would seek to continue the practice that has been taking place for around 30 years. The tradition could be thwarted under the works, which are estimated to cost £65,000 according to the planning application lodged with the local authority. According to the planning application, £10,000 for the works would be provided by Historic Scotland, which has previously warned against the practice of placing a cone on the head of the monument to the victor of the Battle of Waterloo and twice British prime minister. Under plans lodged by the council’s landscape design manager Rachel Smith, the council plans to double the size of the plinth to around 6ft and restore the sabre that is missing from the statue. 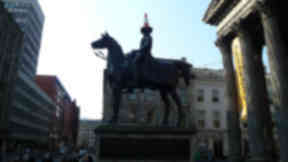 The council application states: "For more than 30 years the Wellington monument has been defaced by traffic cones which regularly appear on the head of the horse or rider (and sometimes both) after the revelries of the weekend. This depressing image of Glasgow has sadly featured in posters and postcards depicting the city. "Ironically this unfortunate impression of the city has been supported by former Lord Provosts and chief executive and even adopted occasionally by the city marketing bureau. These cones have been the subject of numerous complaints from elected officials and the public who find them offensive and this matter is the subject of time-consuming correspondence. "The cost of removing these cones is conservatively put at £100 a time and the frequency is estimated at around 100 times a year, this is an estimated burden to the city council of some £10,000pa. 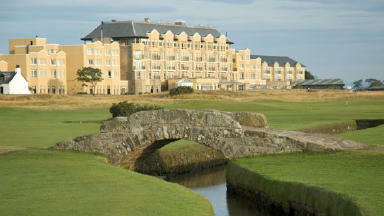 This cost is unsustainable in the current economic climate." The application continues: "To this end it is proposed that permanent solution is found to deter these cones and reduce the incidence of vandalism to this iconic monument. The principal problem is that the base of the monument is too low. Vandals can literally step onto the plinth from the rear and then quickly gain access to the horse and rider. "Various solutions were considered, after a year’s investigation and consultation it was decided to raise plinth to a height comparable to the Victoria and Albert monuments. This would require the insertion of a new concrete base, clad in matching granite – an increase of 0.86 metres (around 3ft). This should deter all but the most determined of vandals." The application was lodged on October 30 and is currently under consideration from the council, while it is not currently scheduled to be decided upon by the local authority's planning committee.